The Middle Kingdom is a period in the history of ancient Egypt stretching from the establishment of the Eleventh Dynasty to the end of the Fourteenth Dynasty, roughly between 2030 B.C.E. and 1640 B.C.E. The period comprises two phases, the 11th Dynasty, which ruled from Thebes and the 12th Dynasty onwards which was centered around el-Lisht. These two dynasties were originally considered to be the full extent of this unified kingdom, but historians now consider the 13th Dynasty to at least partially belong to the Middle Kingdom. The Old Kingdom collapsed due to famine and loss of confidence in the central government, restoration of which gave birth to the Middle Kingdom. Egyptian rule extended to Syria as well as South into Nubia. The concept of Maat, justice or morality including the Pharaoh’s obligation to safeguard this, gained in significance during this era since the collapse of the Old Kingdom was blamed on its neglect, although climate change had been a major factor. The Middle Kingdom is considered to the “golden age” due to its rich literary, architectural and scientific legacy. The Eleventh dynasty of Ancient Egypt was a group of pharaohs whose earlier members are grouped with the four preceding dynasties to form the First Intermediate Period, while the later members from Mentuhotep II onwards are considered part of the Middle Kingdom. They all ruled from Thebes. This dynasty traces its origins to a nomarch of Thebes, "Intef the Great, son of Iku," who is mentioned in a number of contemporary inscriptions. 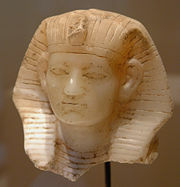 However, his immediate successor Mentuhotep I is considered the first pharaoh of this dynasty. An inscription carved during the reign of Wahankh Intef II shows that he was the first of this dynasty to claim to rule over the whole of Egypt, a claim which brought the Thebeans into conflict with the rulers of Herakleopolis Magna, the Tenth Dynasty. Intef undertook several campaigns northwards, and captured the important nome of Abydos. Warfare continued intermittently between the Thebean and Heracleapolitan dynasts until the 14th regnal year of Nebhetepra Mentuhotep II, when the Herakleopolitans were defeated, and the Theban dynasty began to consolidate their rule. Mentuhotep II is known to have commanded military campaigns south into Nubia, which had gained its independence during the First Intermediate Period. There is also evidence for military actions against Palestine. The king reorganized the country and placed a vizier at the head of civil administration for the country. State and Temple remained closely linked, since the Pharaoh was also High Priest. After the reigns of his successors (Mentuhotep III) and (Mentuhotep IV) of the Eleventh Dynasty ended, there was a smooth transition into the illustrious Twelfth Dynasty. The first Pharaoh of the Twelfth Dynasty, (Amenemhat I), is, according to some sources, the same man as Amenemhat, the Vizier of Upper Egypt, under the reign of Mentuhotep IV. This explains the smooth transition of power in which Amenemhat easily assumed the reins of power after the death of Mentuhotep IV. Amenemhat I built a new capital for Egypt, known as Itjtawy. The location of this capital is unknown, but is presumably the present-day el-Lisht, although Manetho claims the capital remained at Thebes. Amenemhet pacified unrest in Egypt by force and curtailed the rights of the nomarchs. He is known to have at least launched one campaign into Nubia. In 1971 B.C.E. 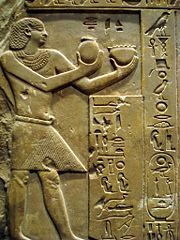 Amenemhat established his son Senusret I as his junior co-regent. In 1962 B.C.E., he was presumably murdered by a royal bodyguard. Senuseret, campaigning against Libyan invaders, rushed home to Itjtawy to prevent a takeover of the government. This proved the worth of the institution of the co-regency since the new king had acquired useful experience by the time he would start his sole reign. The co-regency system lasted throughout the Twelfth Dynasty and provided great stability. Senusret I (1971 B.C.E. – 1926 B.C.E.) continued the policy of his father to recapture Nubia and other territories lost during the First Intermediate Period. The Libyans were subdued under his 45-year reign and Egypt's prosperity and security were secured. Senusret's successor Amenemhat II (1929 B.C.E. – 1895 B.C.E.) made the position of the nomarchs hereditary again (thus weakening the centralized government) and established trade connections with Nubia. A war seems to have been conducted in the Levant. His successor Senusret III (1878 B.C.E. – 1839 B.C.E.) was a warrior-king, often taking to the field himself. He led his troops deep into Nubia, and built a series of massive forts throughout the country to establish Egypt's formal boundary with the unconquered areas of the territory. On the domestic front, he built a fine religious temple at Abydos; while it is now destroyed, surviving reliefs show the high quality of the decorations. He was deified at the end of the Middle Kingdom and worshipped by the pharaohs of the New Kingdom. He gave the Crown to his son in his 20th Year, according to evidence from Papyrus Berlin 10056, but remained the senior coregent. Amenemhat III (1860 B.C.E. – 1815 B.C.E.) was the last great pharaoh of the Middle Kingdom. Egypt's population began to exceed food production levels and Amenemhat III ordered the exploitation of the Fayyum and increased mining operations in the Sinaï desert. He made sure that nomarchs could no longer inherit their nomes as Amenemhat II had permitted. He also invited Asiatic settlers to Egypt to labor on Egypt's monuments. Late in his reign the annual floods began to fail and his successor Amenemhat IV ruled Egypt for just nine full years (1816 B.C.E. – 1807 B.C.E.) before dying prematurely. The largest temple complex that ancient Egyptians built dates from this period. Although this structure did not survive, it was described by Herodotus. The sister of Amenemhat IV briefly reigned as Queen Sobekneferu (1807 B.C.E. - 1803 B.C.E.). As she apparently had no heirs, the Twelfth Dynasty came to a sudden end as did the Golden Age of the Middle Kingdom. These kings appear to have gradually lost their grasp over Egypt. A Fourteenth Dynasty appeared in the Delta region, but the pharaohs of this dynasty seem to have been minor monarchs in the Delta region. The Thirteenth and Fourteenth Dynasties witnessed the slow decline of Egypt into the Second Intermediate Period during which, one again, “power devolved to various local rulers, until foreigners from the East known as the Hyksos extended their authority over a large part of Egypt.” The rulers of Thebes eventually succeeded in re-unifying Egypt from the South, and the New Kingdom of Egypt began with the 18th dynasty. Sculpture, work in gold and silver flourished during what Egyptians themselves consider to have been the “golden age” of their history. Literature also flourished and much material was handed on from the previous era, helping to preserve such concept as Maat (morality, truth, justice) which gained greater significance due to the collapse of order at the end of the Old Kingdom which was blamed on neglect of justice by the Pharaohs. Increasingly, the king’s role was understood as ensuring that order prevailed. Concern for the welfare of subordinates became a social value of which the elite boasted in their own mortuary inscriptions. Mathematical and scientific texts were also written during this era. Extension of rule towards the Middle East as well as commerce and trade ensured that Egyptian culture encountered and inter-acted with other cultures. ↑ Gae Callender, "The Middle Kingdom Renasissance" in Ian Shaw, The Oxford History of Ancient Egypt (Oxford: Oxford University Press, 2000, ISBN 9780198150343). ↑ Agnese and Re, 16. ↑ ”The Ancient Egyptian Labyrinth”, (History, 2.148-49) The Ancient Egyptian Labyrinth Retrieved February 4, 2008. Overy, Richard. The Times Complete Atlas of World History, 6th ed. NY: Barnes & Noble, 2004. History of "Middle Kingdom of Egypt"
This page was last modified on 24 October 2014, at 16:18.